Five full afternoons of surf instruction and beach fun! The Eli Howard Afternoon Surf Camp is open to all ages, and is the coolest adventure of the summer! The camp is all-inclusive, providing five full afternoons of non-stop surfing and beach and camp activities, ocean awareness and knowledge, and just an all-around great time. Your student will have the opportunity to choose from a variety of brand new soft surfboards and full length Rip Curl wetsuits as they learn to surf, or hone their skills. 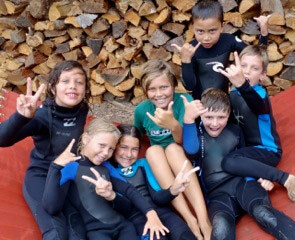 Our camps are a cool way to enjoy the beach and learn to surf for the first time or build on the skills you already have. All of our camps are for all ages and with our small ratios of 3 to 1 all surfers can work in the area of water they are comfortable. Come and hang out in our beach camp with plenty of things to relax with at break: surf movies, ping-pong or basketball, foosball, a surfing center, and more. 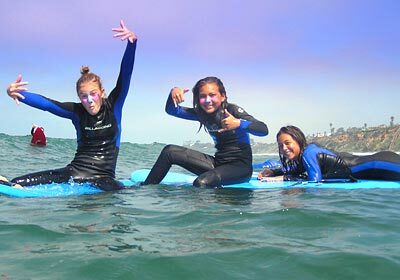 Our 4 hour afternoon camps include daily ocean topics, tons of surfing time, and activities geared toward all surfers. We can go and explore the kelp beds, check out advanced surfboard materials and surfing equipment, and just spend time surfing. These camps operate just like our renowned Morning Surf Camps with our quality 3:1 student-to-instructor ratios, hands-on instruction, helpful feedback, daily refreshments and snacks, and a BBQ on the last day! Grab some friends or meet some new ones at our surf camp this summer. Enrolling your student in the camp will give them a safe non-competitive learning environment to learn to surf. Safety is our highest priority and it begins with all instructors being trained in CPR and First Aid. In addition, all head instructors are American Red Cross certified Lifeguards and EMTs. Safety continues into our daily Camp topics which include how to recognize rip currents, as well as beach first aid tips! Afternoon Surf Camps are held at Moonlight State Beach. If you cannot attend all five days of the camp, daily signups can be arranged at $85/day (space permitting). Call us for details. To confirm a reservation for our Afternoon Surf Camp a $100.00 non-refundable deposit is required at least two weeks prior to the start date of the camp and the remaining balance on the first day of camp. We accept checks or cash, Visa and Mastercard. (Please make checks payable to: Eli Howard Surf School). See our camp packing list for details on what to bring. Monday, June 24, 2019 to Friday, June 28, 2019 1215PM-415PM Moonlight $395 Sold Out! Monday, August 12, 2019 to Friday, August 16, 2019 12PM-4PM Moonlight $395 Sold Out! Didn't find the date you are looking for? Check out the morning surf camp page for additional dates!